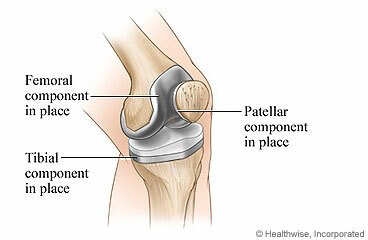 How can you decide about knee replacement surgery? Knee replacement surgery replaces the worn ends of the thigh bone (femur) and the lower leg bone (tibia) where they meet at the knee. Your doctor will take out the damaged bone and replace it with plastic and metal parts. These new parts may be attached to your bones with cement. You will need a lot of rehabilitation, or rehab, after surgery. This takes several weeks. But you should be able to start to walk, climb stairs, sit in and get up from chairs, and do other daily movements within a few days. The decision you and your doctor make depends on how much pain and disability you have. It also depends on your age, health, and activity level. Most people have this surgery only when they can no longer control knee pain with other treatments and when the pain disrupts their lives. Rehab after this surgery means doing daily exercises for several weeks. Most knee replacements last for at least 10 years. You may need to have the knee replaced again. Why might you choose to replace your knee? You are not able to do most of your activities without pain. You have very bad arthritis pain. Other treatments have not helped. You do not have other health problems that would make surgery too risky. You are not worried that you may need to have another knee replacement later in life. You aren't worried about side effects. These may include infections, blood clots, and loss of range of motion. You are willing to do weeks of rehab. You want to have the surgery before you lose too much of your ability to be active. If you are not able to stay active, strong, and flexible before the surgery, it can be harder to return your normal activities after the surgery. Why might you choose not to replace your knee? You can still do most of your activities. You have other health problems that may make surgery too risky. You want to try all other treatments first. You want to avoid the side effects of surgery. You can't do rehab after surgery. You worry that you may need another knee replacement later in life. Enter X279 in the search box to learn more about "Deciding About Knee Replacement Surgery".